When I search for you, what do I find? This children’s rhyme does not apply in today’s highly connected world where a few negative words can cost your company a lot of business. Now everything from quality reviews and recommendations, legitimate issues and reputation damaging complaints are there for the entire world to see. Managing your online reputation is no longer optional and needs a simple strategy that combines monitoring what is available about you and responding appropriately to ensure your business is not unknowingly damaged by negative comments. Even if you have never added your information into Yelp, Yahoo Local, Google Places or other online business directories, it doesn’t mean that your business isn’t already visible online and immune from the backlash of an unhappy customer. 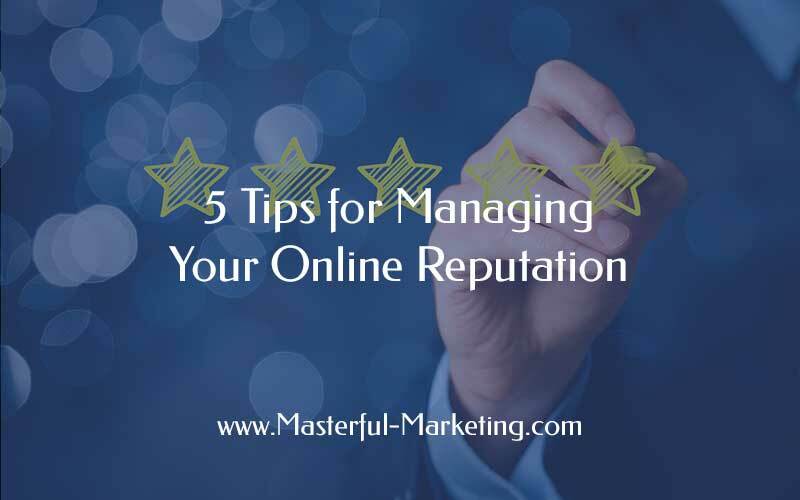 How should your business approach managing its online reputation? Regularly monitor your brand’s reputation – Search for your business name and see what comes up. Doing a vanity search helps you identify not only where you are listed but also what is being said about your company. You want to be sure your information is accurate and complete. Set up Google Alerts for your name and your business name and choose whether you want email updates or an RSS update. Claim your local business listings – According to Google, 97% of consumers search for local businesses online so you need to be visible in a crowded local market. When a listing is claimed, it sends a message that the business is open and ready to help. Unclaimed listings make your business seem out of touch. Make sure the content in the listing is accurate and optimized to include your top keyword phrases to get better visibility for local searches. Stay or get more active online – It’s difficult to remove negative information so your best option is to create more interesting and positive content to push the negative down and out of the first few pages of the search results. If you can make the time, start a blog. If you aren’t ready to commit to your own blog, guest post or post comments on other blogs. Update your status on Facebook, Google+, LinkedIn or Twitter regularly. Google wants fresh content so the more you post, the more content you will have in the search results, moving a not so favorable review out of site. Encourage customers to write reviews about your business– It’s not easy to ask customers for online reviews, but you need to get your best customers to speak on your behalf. Add a note to your invoice asking “How did we do?” and point them to your website. Create a big “Write a Review” button on your website which takes them to a testimonials page that contains links to your Google Places, Yahoo Local, Yelp, InsiderPages or other online review sites. This makes it easy for you to point them to one place where they can click a link and write a review. For most of us, monitoring and managing our online reputation is not that difficult. It takes a little time to monitor what is out there and determine what you need to do to respond or change the perception. This exercise is important to create the image you want your prospects and customers to see. Even if you don’t have any negative content about you, you still have work to do to create an image that is visible, credible and consistent with your brand. If you think you need help, buyer beware. Do a little research and you will discover another industry that has its share of unethical companies. Many of these “reputation management experts” are the same “SEO experts” that I have previously warned you about. Their reputation management services use black hat SEO and other questionable tactics to bury the negative content in the search engine rankings. Once again, when it comes to your web presence, be cautious about who you trust to help you. Do you know how your business is perceived by your customers and prospects? staying online is a most important key factor in making blog relationships. I am using it and participating on most projects to show I am active to the community. Awesome post, Debra! Unfortunately, we’re in a position that requires the company to spend time addressing negative content that could be smudging our brand, but your tips are definitely helpful. We’re all about keeping it clean and playing fair, so it’s going to take longer but it’s something you just gotta’ do.